Johannesburg (South Africa) – For the first time ever, the mixed martial arts promotion that has taken Africa by storm, EFC AFRICA comes to Cape Town. 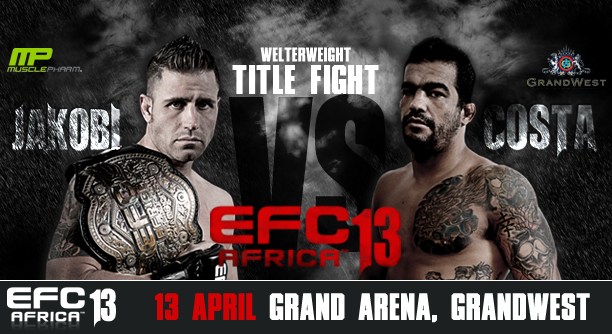 EFC AFRICA 13 on 13 April promises the same bone-jarring submission holds and lights-out knockouts in a new venue, the GrandWest Arena. Also on the card, heavyweight wrecking machines Bernardo Mikixi and Calven Robinson are out for blood. With over 100kg behind every strike, only one contender will be left standing when these behemoths do battle. At lightweight, decorated K1 kickboxer Leon Mynardt takes on one of the world’s top Muay Thai fighters, Don Madge, in what will surely be every striking fan’s dream bout. Mynhardt enters the lightweight division after stunning highlights and frustrating hurdles at welterweight, and brings a wealth of experience to an extremely competitive division. Madge’s reputation for being a combat sport prodigy is well-founded, as evinced by his incredible 50 win, 2 loss Muay Thai record, and emphatic TKO victory at his EFC AFRICA debut in November.